Welcome to the section of the website all about the final year of the Junior School. It’s a wonderful year to teach because the children retain a sense of wonder and joy in their world but have grown a passion for changing things and for making a positive contribution to the lives of others and to life on this planet. Through our curriculum in Year Six and through our teaching about Rights and Respect, we believe that we help the children to become ready to take their place as Global Citizens and to be ready as individuals for the next step in their personal lives, namely the transfer from Primary to Secondary school. 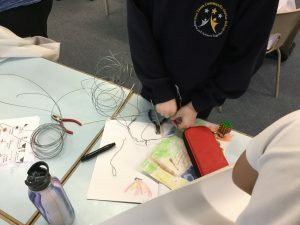 Year 6 produced some fantastic artwork with the help of our visiting artist – Kezia Hoffman. Thank you so much for the warm welcome to Four Lanes Junior School! 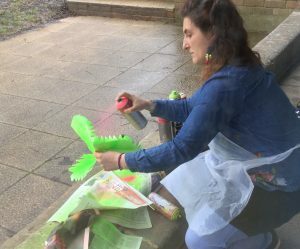 Thank you also to all the students in year 6 who really amazed me with their positive and friendly attitudes and willingness to get messy and creative and try something new. I loved the sculptures they came up and was impressed with their determination to ‘go for it’ even when they found it tricky at times. I would love to see what they make next. Thank you for our homes and comfort, warmth and how lucky we are. Thank you for our families and relatives that guide us through life. Please continue to guide us into the right decisions. Please bless the people that are not as fortunate as us. Help them to get a home and make a wish for them. 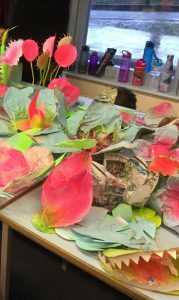 The children sent invitations to parents, family and friends to invite them to come and see the excellent learning outcomes from this term. 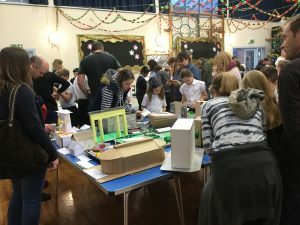 In the hall, we held an exhibition of the homework pieces that the children had produced. 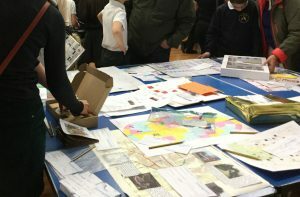 The other children of the school were invited to view and to give feedback and then visitors left comments. We had intended that the Year Six teachers could add a comment for each child but we found that the visitors were so impressed that they filled all the space we had given! You can see how well attended the exhibition was and how busy we got. 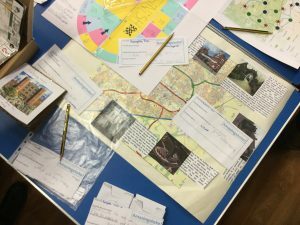 The children designed the layout and themes – based around the different areas of learning set for the homework projects. 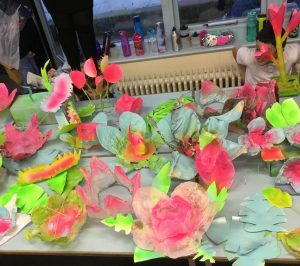 We are very proud of this style of learning as it allows the children to explore parts of the topic that have inspired them and to apply it to other subjects. 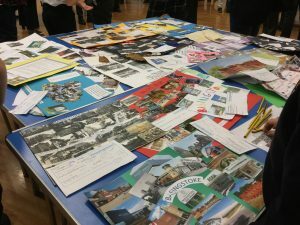 We are even more proud of what the children achieved this year – from a sundial to a cake of the Willis Museum, from a “Basingstoke Concerto” to “Basing-opoly” games, the range and quality astounded us. We hope you enjoy looking through the pictures and seeing why we are so proud. With Armistice Day in mind, we have been writing our own war poetry. 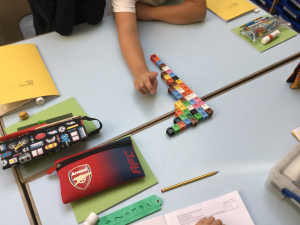 Year Six children started their Maths learning for the year by exploring the Fibonacci sequence.They learned where the sequence can be observed in the natural world and how we can represent it using concrete resources, diagrams and algebra. Spelling Shed – There is a list ready for you to practise and play. This should take around 15 mins each day. https://play.spellingshed.com. If you have a personal list from Mrs Nash then you will see that as well as the main list. It will be great if you do both. Reading – 15 mins reading and discussing with an adult at least three times a week and then reading by yourself the other four days. That should keep you busy and enjoying your learning. Remember that you can also use www.mymaths.co.uk for any DELIBERATE PRACTICE if there are things you want to improve upon or gain more confidence with before we look at them in class.